One of the main responsibilities of the Goolarabooloo Law Bosses (Elders) is to ensure that traditional culture (the Law) is passed down to succeeding generations. The Elders are Custodians of a living history, traditional knowledge of the origin and function of things, and stories and skills that derive from centuries of experience in the area. This body of cultural knowledge is known as Bugarregarre, the Dreaming. It is perpetuated within the Song Cycle which recounts the creative journey of the ancestral beings who made the land and its people. The Dreamtime Beings set pattern for all their creations to follow. Known as the Law, these are encoded in the Song Cycle and ceremoniously passed on from one generation to the next. The Song Cycle is an oral heritage map. Its songs contain codes of behaviour fundamental to sustaining the balance and well-being of the land and its people and are still sung today. Knowledge of such songs shows status and power, as they are central to the insight about the Dreaming and Country. A Song Cycle has a birth place and an end place, it has physical (landmass) length and width but it is not just a track. It is made up with "sites"- places, grounds, increase sites, ceremonial grounds, seasonal food places, vegetation for ceremonial usage, trees, shrubs, plants, ochre, land and water within the Song Cycle land, providing all that is needed to sustain life both for humans and animals. The Song Cycle on the coast of the Dampier Peninsula has its 'birthplace' north of One Arm Point, from whence it travels to the south of Bidyadanga, the exit place. This greater Song Cycle looks after and protects other (east-heading) creation Songlines, which move from the west through Uluru across to the east coast - Sunrise country. All the special places named in the song, many of which are passed on the Lurujarri Dreaming Trail, have their own character of feeling, known as Liyan. The Liyan is believed to be alive and effects people both positively and negatively. It can make you feel happy and elated, or sad and thoughtful. Within this Country, one of the creator beings is spoken of as "Marella", whose ancient footprints and other feather traces remain in the reef that stretches between Minyirr (Broome) and Dugul (Flat Rock, north of Walmadan). 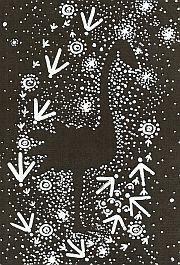 The emu form of Marella persists in the shape of the black abyss of the Milky Way, in the night sky. Sites where three-toed prints occur correlate with the course of Marella's journey, as narrated in the Song Cycle.